Caregiver of the Month Scott Collier has dedicated nearly two decades to caring for others – as both a CNA and Medication Aide. He began in the early 2000’s caring for patients in nursing homes and at the hospital to now being a caregiver with A Place at Home. “Being a caregiver isn’t a paycheck for me, it’s my passion, it’s my calling,” Scott expressed. When Scott first began at A Place at Home over three years ago, he primarily worked with facilities. Until one day he filled in a shift taking care of veteran and stroke survivor, Ron Poe. “I had been working at facilities, but after working with Ron – I knew that I wanted to continue to care for him full-time. He was just great. 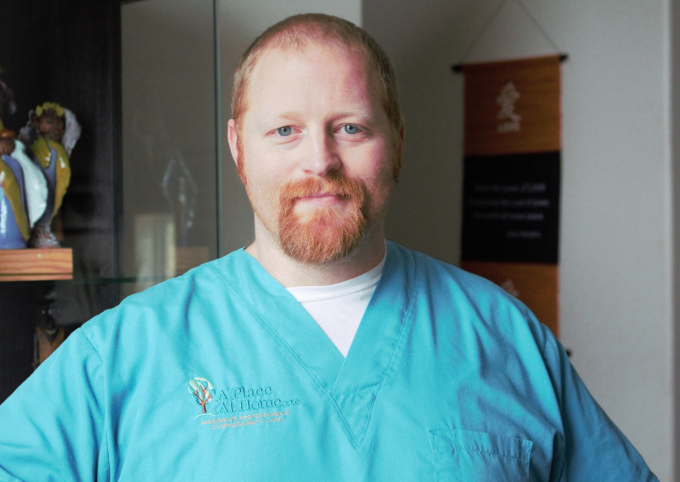 It allowed me more one-on-one time and truly being able to give my all as a caregiver versus trying to care for multiple patients at once,” Scott recalled. Ron’s wife, Deb Poe instantly took to Scott from the very first time he cared for her husband, and even requested that Scott become his regular caregiver. Deb first discovered A Place at Home while Ron was at a rehab facility after experiencing a massive stroke back in September 2015, which ultimately affected his ability to move and talk. “The stroke was very devastating for our family, but even more so for Ron. He was no longer able to do basic tasks on his own. It was difficult, but I wanted to make sure that he was able to stay home. We’re blessed to have the support we’ve had to make it possible for him to be home. We don’t know what we’d do without Scott,” Deb expressed. Deb reiterates that it hasn’t been an easy road, but that she just feels blessed to still have Ron here, alive and well. “I can’t believe it’s been three years since his stroke. I have learned so much, but the most important lesson has been learning to cherish each day because you have no idea what could happen at any minute,” Deb said.